A new study published in Biology Letters suggests that these deep-water seagrass meadows play a more central role in the carbon cycle than previously thought, and their restoration can thus become a major new strategy for restoring our climate. Authors Peter Macreadie of Deakin University in Australia, with Paul York and Michael Rasheed, both from James Cook University, compared carbon stocks from deep-water, mid-water and shallow-water seagrass living at Lizard Island in the Great Barrier Reef. The researchers found that the seagrass in deeper regions contained similar carbon levels as seagrass in shallower waters, despite the lower levels of light reaching them. “These coastal Blue Carbon ecosystems can sequester or remove carbon from the atmosphere about four times the rate of terrestrial forests on land, and they store about 10 times more carbon in the system itself compared to forest on land,” says Jennifer Howard, director of marine climate change at Conservation International. 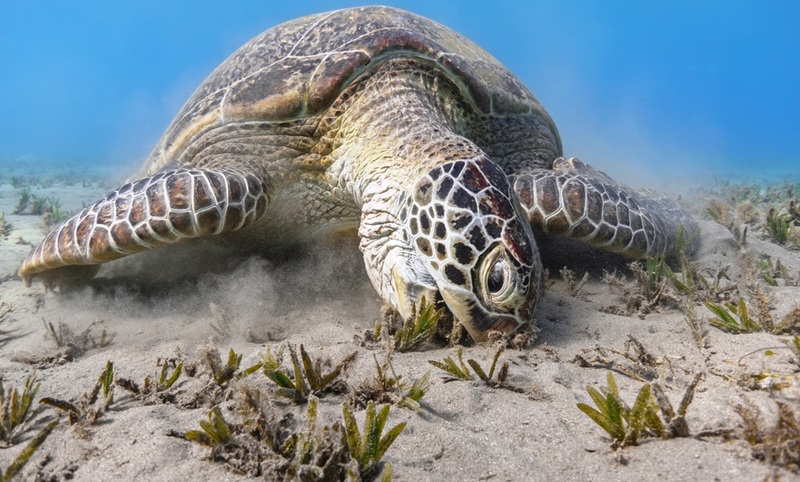 Photo (via Adobe Stock) shows a green sea turtle struggling to find a meal in a depleted seagrass bed.